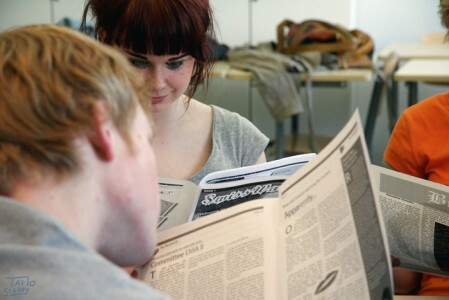 MEdiT 2011 – Apply now! Are you ready to share your experience in journalism and media? Are you ready to revise the concept of non-formal learning? Are you ready to be inspired? Are you ready to become a part of a movement? In October 2011, European Youth Parliament Finland will host MEdiT’11 – a convention gathering over 30 committed young individuals for five days to discuss, experience and shape future ideas about using media in intercultural youth dialogue and the role of the media in non-formal learning. The aim of MEdiT’11 is to gather, revise, and disseminate knowledge and best practices in the field. Between 26th and 30th of October the participants engage in an open space format to share and learn about topics they find important and inspiring. Each participant acts as a learner and as a trainer. In this way, the sharing of knowledge and best practices as well as the needs of the participants are brought to the fullest. Additionally, there will be input from external experts and excursions. The convention will be held in the Happi Youth Media Centre in Helsinki, which provides excellent facilities for working with all types of media (desktop publishing, internet, video, audio) and space for constant group facilitation and evaluation to support the learning process. The target group of MEdiT’11 are young people, who are active in intercultural youth dialogue and exchange and have already gathered experienced non-formal learning and the usage of media as a supportive tool. This event is especially designed for members of the European Youth Parliament and the European Youth Press. However, members from other organisations are welcomed to participate. – are available between the 26th and 30th of October (Arrivals on the 25th, departures earliest in the evening of the 30th). To apply for MEdiT’11, please fill out the application form here found here: http://bit.ly/l5jbff. The deadline for applications is the 3th of July 2011, 23.59 CET. The selection of the participants will be completed by the 10th of July. MEdiT’11 is supported by the Youth in Action programme. The participation is for free, accommodation and food will be provided by the organisers, travel costs will be partly (up to 70%) reimbursed. We are looking forward to your application. If you have any questions, feel free to contact us via eyp.edit@gmail.com. Further information can be found on Facebook (on.fb.me/ll7I0W) and medit.eypacademy.org. MEdiT’11 is a joint effort of the European Youth Parliament Finland, EYP Academy, European Youth Press, Happi and Valtikka.fi.